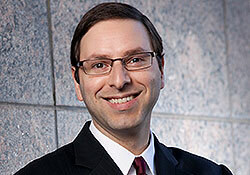 Professor Stephen Sachs discussed the amicus brief he filed with the U.S. Supreme Court in Franchise Tax Board of California v. Gilbert P. Hyatt on the “First Mondays” podcast on Jan. 28. Sachs co-authored the brief, focused on the issue of sovereign immunity, with Professor William Baude of the University of Chicago Law School. It was filed on behalf of neither party and articulates a novel interpretation of the origins of sovereign immunity in U.S. law. On the central issue before the Court, whether states enjoy sovereign immunity in other states’ courts, they argue that while the Constitution does not impose its own rule on the issue, such immunity was accepted by the framers as a matter of settled law. Justice Elena Kagan referred to their brief several times during oral argument on Jan. 9. The brief offers a way of thinking about sovereign immunity that is “quite different from how the Court has been thinking about it and the parties think about it,” said podcast host Dan Epps, a professor of law at Washington University in St. Louis. The case emerges from a long-running dispute between Hyatt, a Nevada resident, and the State of California, which sued him for taxes on income he earned in 1991 and 1992. The Nevada courts found that California sent agents into Nevada to collect evidence against Hyatt and that it committed various tortious acts. The issue presently before the Court is whether California’s Franchise Tax Board must pay a portion of the judgment for tortious conduct. California argues that its sovereign immunity protects the Board from being forced to answer in a Nevada court. Because the Constitution left the principle of sovereign immunity alone, Sachs said, it remained a “background feature” of the federal system. The Constitution did not forbid state courts to issue judgments against other states, but it also did not make these judgments enforceable in other courts. “What it did was negative,” he said. Sachs, who teaches Civil Procedure, Conflict of Laws, and seminars on constitutional law (including a spring 2019 seminar called Originalism and Its Discontents), explained that the Hyatt brief builds on prior work in which he and Baude have pointed to a legal basis for sovereign immunity. “There’s the sense that, of course, the states have to have sovereign immunity somehow,” he said. “Clearly this is something they talked about [at] the founding; they talked about it a lot in the ratification conventions. And yet there’s no piece of text, there’s nothing to hang your hat on.